We’ve a study, published in the Journal of Virology (JVI), that uses the mouse model to explore the possibility of using camel antibodies as a treatment option for MERS-Cov infection. As we discussed last year in MERS-CoV: The Long Road To A Pharmacological Solution, with no coronavirus-specific therapy in our arsenal, treatment for infection has basically been supportive (e.g. fluids, vasopressors, ventilators and/or ECMO, dialysis, and antibiotics for secondary infections). We’ve seen some limited testing of Ribavirin & Interferon Treatment of MERS-CoV, but he results from treating humans with this drug combo were far from encouraging. Other drugs are under investigation, like Biocryst’s experimental antiviral BCX4430, but it is too early to know how effective it might be. The therapeutic option with perhaps the most promising future is the use of Convalescent Plasma, taken from patients who have already recovered from infection, but here again, there have been roadblocks, Many MERS survivors – due to advanced age, general health, or low antibody titers – are poor donors. The idea of using convalescent serum for MERS goes back nearly two years; This is from the World Health Organization Novel coronavirus summary and literature update – as of 8 May 2013. Making headlines last year, and sparking a great deal of Arabic twitter traffic, was talk that serum antibodies might be harvested from camels, along with camel milk immune proteins, and then used to treat human infections. It is not that far-fetched, as horse serums have been used for treating humans for more than a century, although their use has declined in recent years due to concerns over adverse reactions and other available options. As nearly all adult camels in Saudi Arabia have been infected with MERS-CoV, they carry specific antibodies against the virus (see Lancet: Camels Found With Antibodies To MERS-CoV-Like Virus), and could theoretically be an abundant source for convalescent serum. Fast forward to today, and we have a study in the Journal of Virology (JVI) and an accompanying press release, that looks at using dromedary convalescent plasma to treat (or protect against) MERS-CoV infection in mice. Mice are not a perfect analog for humans, and normally are not even susceptible to the MERS virus (nor are most lab animals, including non-human primates, making studies difficult). Transgenic mice, however, can be rendered susceptible to the virus, and this study found that camel sera was shown to be protective against a MERS-CoV challenge. The caveat being that what works on mice may not necessarily work in humans. Passive Immunotherapy With Dromedary Immune Serum In An Experimental Animal Model For MERS Coronavirus Infection. The Middle East Respiratory Syndrome (MERS) is a highly lethal pulmonary infection. Sera from MERS convalescent patients may provide some benefit but is not readily available. In contrast, nearly all camels in the Middle East were previously infected with MERS-CoV. Here, we show that sera obtained from MERS immune camels augment the kinetics of MERS-CoV clearance, and reduce the severity of pathological changes in infected lungs, with efficacy proportional to MERS-CoV neutralizing serum antibody titers. Could antibodies from camels protect humans from MERS? Antibodies from dromedary camels protected uninfected mice from Middle East Respiratory Syndrome (MERS), and helped infected mice expunge the disease, according to a study published online March 18th in the Journal of Virology, a journal published by the American Society for Microbiology. MERS, which emerged in humans last year in the Saudi Arabian peninsula, causes severe respiratory disease, with a high mortality rate of 35-40 percent. No specific therapy is currently available. "Our results suggest that these antibodies might prove therapeutic for MERS patients, and might protect uninfected household members and healthcare workers against MERS," says corresponding author Stanley Perlman, MD, PhD, a professor in the Departments of Microbiology and Pediatrics, the University of Iowa, Iowa City. 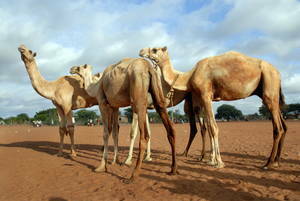 Suspecting that humans and dromedaries were likely infected by the same virus, first author Malik Peiris, D. Phil., Professor of Medical Science, School of Public Health, the University of Hong Kong, SAR, China suggested that camel sera might be used to combat MERS. The vast majority of dromedaries on the Arabian peninsula are infected, and many have high antibody titers. The investigators decided to test dromedary antibodies against virus taken from humans. They tested the antibodies in mouse models infected with the latter virus.